Born April 5, 1944 in Okinawa Prefecture. Graduated from Tokyo University of Education (now University of Tsukuba) Graduated from the Graduate School of Letters, Graduate School of Letters (Master of Letters). Graduate School of Letters Graduate School and then went on to earn his PhD. 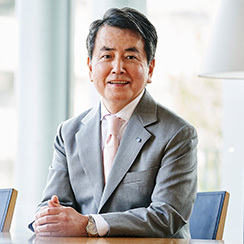 He has taught at Kwansei Gakuin University, University of Tsukuba, and Waseda University, before serving as Vice President of Otemae University. He has held his current position since April 2016. In addition to his work at Otemae, he served as President of the Japanese Sociological Association, Chairman of the Japan Environmental Society Association, Chairman of the Japanese Life and Cultural History Society, and served as Japan’s national delegate to the International Sociological Association. His research focuses on environmental sociology and folklore studies, but he is also involved in research about town planning, environmental problems, and regional culture. He is active is field work and lecturing around the world, traveling to places such as Guatemala, Mongolia, the United Kingdom, the United States, China and South Korea. His representative books include "Studies of the Tokara Islands Society" (Ochanomizu Shobo), "Water and the Japanese" (Iwanami Shoten), "Research of the Local Communities Association" (Minerva Shobo), "The Folklore of the Yanagida School" (Tokyo University Shuppan), "Ruins of the Ryukyus kingdom and Hawaiian immigrants" (Yoshikawa koubun kan), "Visiting the Flowers on Yoshinoyama" (Shueisha), and "Sazae-san's laws of community" (NHK shuppan), among others. What do you expect from university? Perhaps, you would like to expand your future possibilities, and you hope that university will make your dreams into reality. We at Otemae University want to help our students themselves grow their potential so that they can realize their dreams. And we have a curriculum of which we are especially proud. In particular, we lower the barriers between different departments as much as possible, so that after enrollment it is possible for students to study in different disciplines to rediscover what they really want to learn. Although I have said the word "help" now, the protagonist in this story is the student. When I mention the words possibility and dreams, you might imagine a great ocean stretching before your eyes. However, the reality is that you can only advance one step at a time, like climbing a mountain, and obstacles will appear, and you will encounter difficulties such as rugged rocks, rolling stones, winding routes, and so much more. Therefore, as a student making their own story, you must overcome these with your own efforts, with your own patience, with your own endurance. That said, a university education is not simply moving forward but also appears in the meaning of the word “learning.” Otemae University supports each student in their "learning", and when you graduate, we want you to be self-confident and have pride in yourself. Our university has great expectations for the personal growth of our students. Over the course of its 50 year history, Otemae University has accumulated specialized technical techniques, such as methods to master each specialty and ways to strengthen fundamental abilities in skills such as English, among others. Together with this, we believe that it is very important that if students encounter great difficulties in their lives, they have the ability and the knowledge to overcome these with their own skills and power. Although the diverse contents of our multiple courses are described in this university guide, the same basic spirit underscores them all. As a result, we are proud of our high employment rate among our graduates. This is evidence that our educational philosophy and academic training meets the demands from society. Otemae University has three campuses in Nishinomiya City (Faculty of Cultural and Historical Studies, Faculty of Modern Social Studies, and Faculty of Media and Arts), Itami City (Basic / Liberal Arts Education) and Osaka City (Faculty of Health and Nutrition). All of them are quite close to the station, and the location is ideal for students to access. When you visit the university's open campus, I think that you will notice the friendly atmosphere, and you will discover a place that you can fit in, together with the welcoming brightness of the other students. Otemae University welcomes you with open arms.